Aarhus, the second largest city in Denmark is the city where I live now. It might not be as famous as the capital, Copenhagen, but there are some masterpieces of architecture that are worth to have a look at. We will go from the traditional trace first. Møllestien is a picturesque cobbled street with a true old beautiful village feeling in the center of Aarhus. This street is filled with colorful small houses in which every house in average has two windows and one door. Most of these houses here were built between 1870 and 1885 and nowadays many agree that this is one of the most beautiful street in Aarhus. 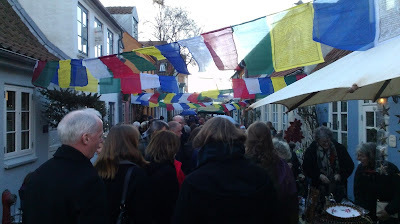 In early December 2015, I had a chance to visit the Christmas market at Møllestien and it was a true unique experience that so many people filled this street! Den Gamle By is an open air museum in Aarhus which consists of 75 historical buildings from 20 towns/area in Denmark. Entering Den Gamle By complex, you will feel like you are brought back into the old days. These old buildings are not just for display, because you can (and are suggested) to enter them as every building has its own story, e.g. a house for a shoemaker, bakery shop, etc, Many of the staff here also wear oldie dress and I would recommend to visit Den Gamle By during summer as this is an open air museum, if you know what I mean (yes, to avoid the rain and the cold and the darkness). AROS is a modern art museum that is located in the center of Aarhus, Denmark. This is one of my favorite spots in Aarhus as it exhibits many different kind of art that some of them are there for one year or even less than one year. For instance, I just visited AROS in November and they had an exhibition of Monet - Lost in Translation that will just be there until 10 January 2016. This exhibition showcases the selection of the greatest French impressionists, in which one third of them are from Monet. It was a truly beautiful art. although it was not really a modern art (nowadays many people refer modern art with contemporary art). And most importantly, rainbow panorama is one eternal part in the highest floor of AROS that cannot be missed. Rainbow panorama was designed by Olafur Eliasson, a famous Danish-Icelandic artist that designed so many iconic artworks and he is also one of the world's most accessible creators of contemporary art. You could see the view of the city from above with different colors of rainbow from the glass wall. 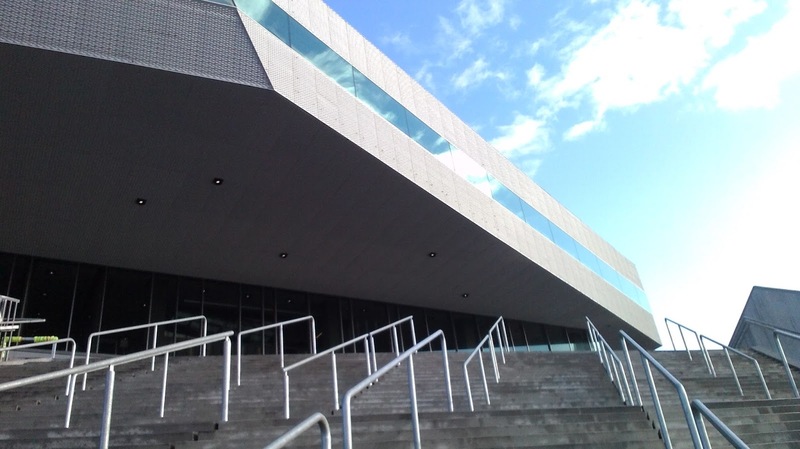 The last architecture piece that's just opened in the summer 2015 is Dokk1. Dokk1 is a big beautiful modern urban space that covers Aarhus main library, citizen service, and some offices, e.g. Aarhus 2017 European Capital of Culture. This building was designed by Schmidt Hammer Lassen architects and it is a polygonal glass building with views to the harbor, city, and water. Dokk1 was built quite high from the ground with many staircases heading to the main entrance and it has plenty space of children playground, canteen, mini theater room that can be functioned as a place to organize small concert, and it also has a soundproof reading room. The interior inside Dokk1 is also marvelous decorated with beautiful lamps and other decorative art like the magic mushrooms in the picture above. Dokk1 is located close to the new harbor, so when you are in the Dokk1 you can see what is going on in the harbor. It is my new favorite spot and in my opinion the most beautiful building in Aarhus, especially in a sunny day as you can feel the sunlight comes in from the glass wall. Anyway, during the night Dokk1 also looks spectacular, especially when there is a special performance like the lightning show I saw (It was called Lys Mere Lys or Lights More Lights).